Just wanted to update you on a couple boats. I am a member at Kitsilano Yacht Club, Vancouver, BC. I am Fred Grimm’s son and have been sailing 505’s with my dad since I was 8 years old. Now 35, I’ve taken some interest in owning some 505’s of my own. Life and work don’t allow me to be on the water every day but I certainly think about it every day! 8263 is now owned by me, Peter Grimm. I purchased the boat from Bob Lehody as he lost interest a couple years ago. 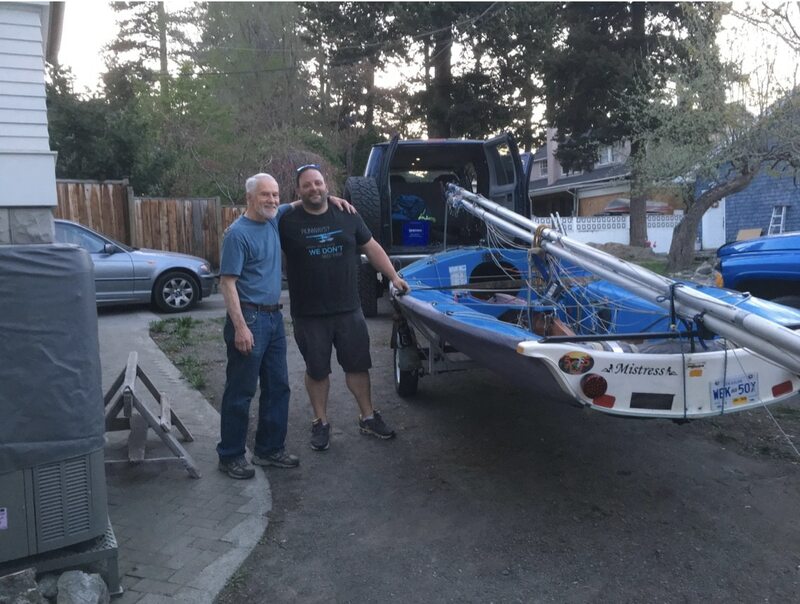 The boat was completely refitted by Rob Mulder about 5 years ago including a carbon offset launcher, fully rebuilt carbon floor, all new rigging, foils, etc. 7249 is now owned by me, Peter Grimm. Owned by Trevor Owen of Kamloops, BC since 1990 it is a Hamlin boat, launcher and in need of some TLC and refit. I plan to complete all that and have ‘er back sailing soon with all the latest and greatest goodies. I competed against this boat for most my teenage years so it’s a pleasure to take on the project. 7959 is my dad’s boat of the last 10 years. Being a glass Kyrwood she went soft and we retired her this spring. The boat lives on as a light board. See attached photo when I picked up 7249 a couple days ago. My dad purchased 8453 from Terry Thomas this spring. It is fitted with a carbon offset launcher. He’s hoping to sail that boat for some years to come. I hope my dad gets another 10+ years on the water as he’s 65 at the end of may this year. I keep sailing with him to keep some dreams alive though he’s not the super crew he used to be. 505’s will be a lifetime obsession…just another sailor checking in with some history for your page.